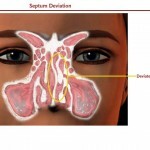 The nasal septum (which when deviated is known as a deviated septum) is the part of the nose which supports, separates both the nostrils into two equal halves. 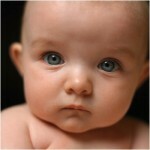 When this septum is deviated for any reason, the condition is known as a deviated septum. 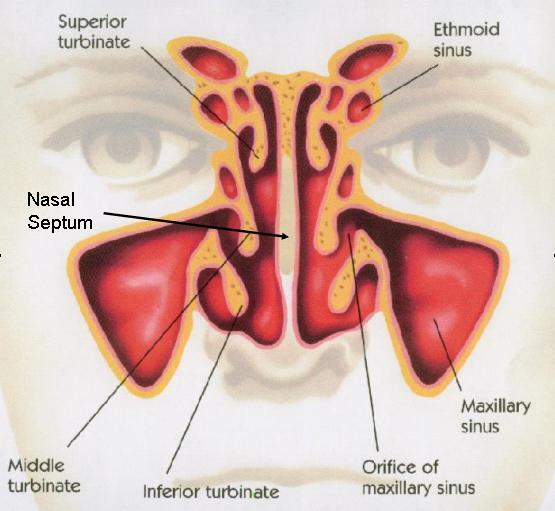 Support: The primary function of the nasal septum is to support the nose structurally to ensure that it stays in its correct position. Additionally the nasal septum also supports the mucous membrane. 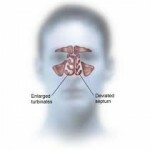 Airflow: The second and equally important function of the nasal septum is to separate the nostrils into two equal halves, thereby ensuring the smooth and free flow of air during respiration. 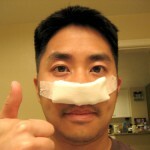 When the septum becomes deviated (because of any reason), based on severity of the condition, smooth airflow during respiration will be disrupted. This disruption will cause many of the breathing related problems which people with a deviated septum suffer from such as snoring, congestion, susceptibility to allergies etc. Additionally if the septum is severely deviated, it will prevent the drainage of the sinus (thereby causing recurring sinus infections). Usually only the cartilage will be deviated, but if the amount of trauma the nose is exposed to is large, then even the bone can become deviated. Either way both are known as a deviated septum. 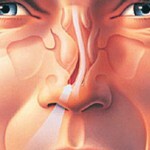 Are you suffering from Apnea Deviated Septum?